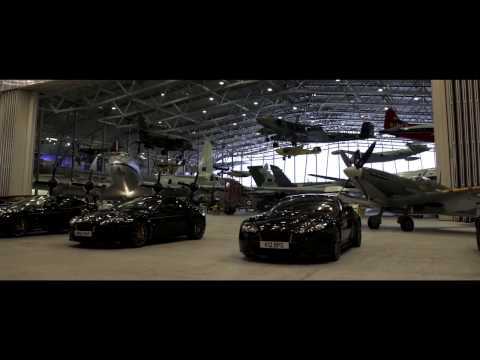 The VIP guests gathered at the Imperial War Museum (IWM) at Duxford, Cambridge for the unveiling of their new limited edition Aston Martin. Britain’s best-preserved Second World War airfield and Europe’s premier aviation museum provided the perfect backdrop for the owners to get their cars up to speed for the first time on the IWM’s famous runway. To get the adrenaline pumping and to immerse guests in Spitfire’s heritage, Aston Martin Cambridge extended the day to include a Spitfire flight experience with Classic Wings, an armoured vehicle driving experience, as well as a personal tour of the museum and talk from a veteran Spitfire pilot. Customers then had the chance to get up close and personal with their new vehicles, receiving a presentation from the Aston Martin Q design team to tell the story of the car’s design and its unique features, before watching one of the last Mark I Spitfires in the world conduct a stunning display. A modern-day icon for car enthusiasts, the Aston Martin V12 Vantage S Spitfire 80 has been tailored by Q, Aston Martin’s personalisation service. The car has been created in a special, Duxford Green colour, with the trademark Spitfire yellow pinstripe on the side strakes and deck lid. Also included are front and rear diffusers in satin carbon fibre; a louvred bonnet in Duxford Green to create a bold profile; and solid sterling silver Aston Martin wings badges with tailored ‘Old English White’ inlay. The interior of the ‘Spitfire 80’ model boasts an array of features including the Spitfire 80 logo embroidered in Raven Black onto the headrests; saddle leather floor mats with sheepskin inserts in relating to the iconic Irvin jacket; the passenger airbag embroidered with its unique aircraft identification code; and door inserts finished with door pulls in red ‘webbing’ to match the Spitfire aircraft. To make the unveiling a day to remember, Aston Martin Cambridge presented customers with a unique Irvin Jacket with Spitfire 80 logo stitched inside; Irvin flying helmet and flying goggles; themed car cover; embossed owners’ manual; and a leather photo album featuring high quality images taken on the day. Simon Lane, Dealer Principal at Aston Martin Cambridge, comments: “The V12 Vantage S Spitfire is a stunning example of Aston Martin’s superb engineering and is equipped for exceptional performance. A nod to the maiden flight of the Supermarine Spitfire, the interior has design touches that follows the aviation theme to make this a truly special and unique vehicle to own. For further information about the range of models available at Aston Martin Cambridge, visit www.jardinemotors.co.uk/aston-martin or go to Aston Martin, 142 High Street, Harston, Cambridge, CB22 7TN, or call (01223) 964851.